Home - Enliten Management Group, Inc.
Enliten specializes in helping organizations develop business and technology strategies using digital media for enterprise communications and workplace learning to meet their business objectives. For Effective Visual Communications and Learning Contact Enliten! Enliten specializes in developing media business strategies and roadmaps for enterprise communications and workplace learning. We are experienced in working with and across all company stakeholder groups and functional support organizations, providing guidance and support from discovery sessions through solution selection, implementation and validation. Enliten enables enterprises to select the best media and learning solutions for achieving their desired business outcomes. Meet your business objectives by leveraging our expertise and the right blend of our services from conducting analysis to assessments, solution selection, cost models, business justifications and benchmarking. Enliten assists product and service providers in developing their business strategies and plans that best meet the needs of their enterprise clients. Get our perspectives and guidance on what enterprise organizations need and are doing and if your solutions are on target with their requirements. In the Enterprise, it is called Employee-Generated-Content (EGC) EGC. Encourage it. Support it. Make it work across, and add value to, the enterprise video ecosystem. 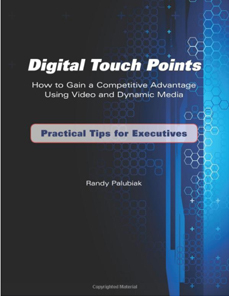 The book provides guidance and tips for executives to leverage video and dynamic media across the enterprise ecosystem to achieve successful business communications and workplace learning. Digital Touch Points Book Now Available for Purchase!